Best dealership! We've purchased 2 vehicles from them and our experience has been great. Ask for Aaron, great salesman to work with...no bs! My service rep was very helpful and the service time didn't take to long with all the work I had done. Thank you for your help. While I didn’t purchase my vehicle from Landers, I give their service center 5 stars! I have used their service center twice now for my dodge and have another appointment scheduled this weekend for my Jeeps maintenance. They have excellent customer service, documentation, and knowledgeable staff. They are quick and thorough with their work. The wait is nice in their waiting room with comfortable seating a nice TV and drinks and snacks. Nothing but good things to say so far! Teresa Yargee is an awesome service rep! Also, I like the opportunity to purchase service packages from Landers so that my visits are extremely simple. 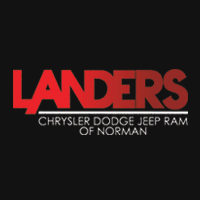 Welcome to Landers Chrysler Dodge Jeep Ram of Norman, Oklahoma! We are so proud and excited to be serving our new neighbors right here in Oklahoma, and to be the exclusive auto partner of the Sooners! Whether you’re from Norman, Moore, Oklahoma City, Midwest City, El Reno, Chandler, Shawnee, Blanchard, Chickasha or Pauls Valley, we’re proud to call you our neighbor. Our website is here for you to browse our extensive selection of new and used vehicles online at your convenience. We offer a wide selection of new and certified pre-owned vehicles, along with on-site service and financing departments that are ready to help you with anything you could possibly need during your search. Our dealership, formerly known as David Stanley Chrysler Dodge Jeep RAM of Norman, is now a part of the Landers family! We’re a family-owned dealership that lives to serve our community through outreach within our hometown, outstanding car-buying experiences, unmatched customer service, our always low, low prices and of course, Sooner pride! If you’re in the market for a new vehicle, Landers Chrysler Dodge Jeep Ram of Norman has what you need. With our extensive variety of vehicles along with plenty of financing options, there is a new car option for everyone. Come give one of our RAM 1500s, RAM 2500s, Jeep Wranglers, Jeep Cherokees, Dodge Challengers, Dodge Chargers, Chrysler 300s or Chrysler Pacificas a test drive today. Landers Chrysler Dodge Jeep Ram of Norman also deals in top quality, certified pre-owned and used vehicles. Our professionally cleaned, inspected and certified pre-owned vehicles look and feel just like new. But the best part is that they come at a lower cost than a new vehicle and with greater peace of mind than a typical used car. These vehicles come with our seal of approval, so you can shop without the stress. We also offer a wide selection of thoroughly inspected and professionally cleaned used vehicles. These pre-owned vehicles can get you on the road at a fraction of the cost of a new car, but look like new so that no one would ever know! At Landers Chrysler Dodge Jeep Ram of Norman, you get to save in style. When you do decide on the perfect vehicle, financing doesn’t have to be intimidating or confusing. Our on-site financing office is here to make your car-buying experience smooth and enjoyable from test drive to take home. When you step into our financial office, your personal consultant will walk you through all your available auto loan and lease options and it is our goal to always get you the best deal. When it comes time to get your vehicle serviced, no one can beat the efficiency, convenience and quality of Landers Chrysler Dodge Jeep Ram of Norman. Our factory-certified, expert technicians know cars. Their knowledge and experience mean your vehicle will always be in good hands. Maximize your vehicle’s performance with an oil change, coolant flush, transmission flush, engine tune-up, tire rotation, tire balance, wash/wax, interior detailing, front-end alignment, air conditioner repair, muffler replacement or brake adjustment at Landers Chrysler Dodge Jeep Ram of Norman. Should your vehicle ever need more serious repair, you can always trust us to have the authentic replacement part you need. Our location always has an extensive stock. We can also order anything else you may need online. You can even send us a part request online to make sure we have what you need without ever leaving your living room! At Landers Chrysler Dodge Jeep Ram of Norman, we live to serve. We are so proud of our new community here in Oklahoma and cannot wait to provide the best vehicle servicing and buying experience in the area. If you have any questions, or would like to request information about any of our inventory or services, give us a call at 855-858-7675, or come see us at 481 N Interstate Dr, Norman, OK 73069. We can’t wait to say hello!